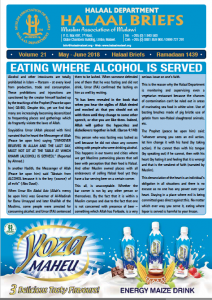 Muslim Association of Malawi has praised Halaal Department for making sure that Halaal food is easily accessible to the Muslim Community in Malawi. This was said by Sheikh Allie Kennedy the Chairman of Trustees of Muslim Association of Malawi (MAM) at the Annual National Meeting organized by the Halaal Department at Balaka Islamic Institute in Balaka. Sheikh Allie Kennedy said that MAM always acknowledges and appreciates the efforts and the keen interest shown by our Sheikhs and Moulanas from Blantyre, Lilongwe, Zomba and Mzuzu, who are working hand in hand with Halaal Department to ensure that all food and other issues regarding Halaal are adhered to. He commended Halaal Department committees from various districts for the continuous support they are providing to HD activities in their districts. On finances, the MAM Trustees Chairman said that since he started attending HD meetings three years ago, he knows the challenges which HD is going through mainly financial, human resources and operational issues of which some of the targeted areas are not yet met. He said that although HD clients contribute certain percentage of money to HD, that funds are not enough to meet HD operations across the country. HD is found in budget deficit every year which keeps on increasing. He asked everyone to pray for way-out of the deficit. He commended the well-wishers who come in and bail out the shortfalls. What will happen if those well-wishers stop funding HD programs? He imagined. The MAM Trustees Chairman, appreciated and encouraged HD staff members for bearing with hardships they are going through. He said he believed that it is not deliberate move for the HD management to let its staff to face hardships but rather it is the wish of Halaal Department that had it been it had enough financial muscles it could have employed more personnel and improved the welfare of its staff and possibly it could have reached all targeted areas country wide.